After the expulsion of the last Etruscan kings, a new form of government emerged in Rome. The Roman government was now a republic. In 509 B.C., only citizens in the new government had rights, and only the men who were born in Rome could be citizens. Everyone else was excluded. In Rome there were two classes of citizens. At the top of the social order were the patricians, who were wealthy land owning aristocrats. They were the only ones allowed to hold government offices or vote. The other class of people were called plebeians. These were the people that worked in the trades, as servants, and as farmers. Rome was governed by a tripartite (three part) government. The Etruscan kings were replaced by two elected executive officials called consuls. The consuls were the executive branch of the government. Consuls also had all of the military power. They each had the right to overrule the others decision. They served simultaneously for a period of a year. The majority of consuls had served in the Roman Senate. The Senate was the legislative branch of government, and its main purpose was to advise the consuls. The third branch of the government was judicial, and it was called the Tribunal Assembly or Comitia Tibuta. They had the right to pass laws and appoint judges. The idea of a Senate originated with the Etruscans. The Etruscans used their Senate to advise their kings. At first, the Roman Senate did the same thing. Then, as Rome became larger and more powerful so did the Roman Senate. Before long, all matters of great importance, had to be approved by the Senate. Roman citizens voted on several important political positions annually. They elected censors to keep tax records, judges who were called the praetors, high priests, and the chief financial officers called quaestors. After a while, the plebeians got tired of the patrician controlled political system. They especially didn't like serving in the Roman army, when they couldn't vote or hold public office. Basically, they didn't have any rights, and the laws were not in writing. Each plebeian interpreted the laws the way he chose to interpret the laws. Then in 400B.C., the plebeians won a major victory when they forced the patricians to grant them political representation. Plebeians were now allowed to elect representatives who were called tribunes. The tribunes could veto any distasteful unfair acts or laws. In addition, Roman law would now be codified and written down. The Roman written law was called the Twelve Tables. This was because it was written on 12 wooden boards. 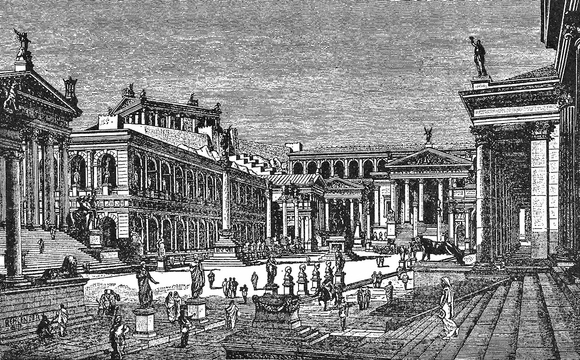 At this time, Rome remained a Republic that was run by the wealthiest aristocrats. A major conflict erupted in 133 B.C., when the bothers Tiberius and Gaius Gracchus, proposed giving land to those who did not have it. The idea got them both killed by supporters of the Roman Senate. This sent the government of Rome into turmoil. As a result, Rome was no longer a Republic but instead emerged as a political dictatorship. First, General Marius seized control, but accomplished very little. Next, in 82 B.C., the patricians appointed General Sulla. He killed all who opposed him before taking over as dictator. Then in, 45 B.C. Julius Caesar took control and things would never be the same. After this time period, leaders were no longer elected, but instead control was now in the hands of the people who ruled with the most force. From this time on, the emperor chose his successor and the senators. There was no voting.